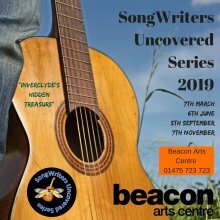 Inverclyde’s hidden treasure returns full swing in 2019 bigger & better than ever – with a host of acclaimed singer songwriters from across Inverclyde and the West of Scotland. In addition to four main events in the Beacon Studio theatre across the year, each featuring six artists, there will also be spotlight events in various community venues across Inverclyde featuring even more artists throughout the year. *Season Tickets cover the four Beacon Studio Theatre gigs. Please call or visit Box Office to purchase a Season Ticket.